Induced resistance offers the prospect of broad spectrum, long-lasting and potentially environmentally-benign disease and pest control in plants. Induced Resistance for Plant Defense 2e provides a comprehensive account of the subject, encompassing the underlying science and methodology, as well as research on application of the phenomenon in practice. 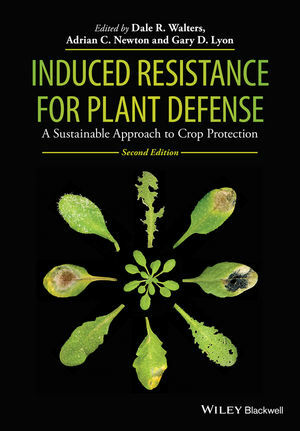 The second edition of this important book includes updated coverage of cellular aspects of induced resistance, including signalling and defenses, costs and trade-offs associated with the expression of induced resistance, research aimed at integrating induced resistance into crop protection practice, and induced resistance from a commercial perspective. Current thinking on how beneficial microbes induce resistance in plants has been included in the second edition. The 14 chapters in this book have been written by internationally-respected researchers and edited by three editors with considerable experience of working on induced resistance. Like its predecessor, the second edition of Induced Resistance for Plant Defense will be of great interest to plant pathologists, plant cell and molecular biologists, agricultural scientists, crop protection specialists, and personnel in the agrochemical industry. All libraries in universities and research establishments where biological, agricultural, horticultural and forest sciences are studied and taught should have copies of this book on their shelves. Dale Walters is based at the Crop and Soil Systems Research Group, Scotland's Rural College (SRUC), Edinburgh, UK, where he is Professor of Plant Pathology. Adrian Newton is based at the James Hutton Institute, Invergowrie, Dundee, UK, and is also Visiting Professor of Cereal Pathology at SRUC (Scotland's Rural College, UK). Until recently, Gary Lyon was based at the James Hutton Institute in Dundee, UK.